Laos is one of the poorest countries in South East Asia. 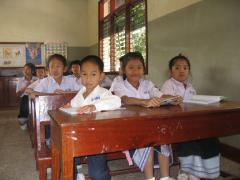 SOS Children's Villages started working near the capital city of Vientiane in 1993. In the following decades, and due to the continuing hardships faced by the people of Laos, our organisation has expanded and adapted its work. SOS Children's Villages now supports children, young people and families in six locations throughout the country. At present there are six SOS Children's Villages in Laos, five SOS Youth Facilities, six SOS Kindergartens, five SOS Hermann Gmeiner-Schools, one SOS Vocational Training Centre, three SOS-Social Centres and one SOS-Medical Centre. Laos, officially called Lao People's Democratic Republic, is a one-party Communist State located on the Indochinese Peninsula in South East Asia. The country borders China in the north, Vietnam in the north-east and east, Cambodia in the south, Thailand in the west and Myanmar in the north-west. Around 6.5 million people live in Laos (July 2011 est. ); the capital Vientiane is the largest city and home to nearly 800,000 people (2009 est.). In the past two decades, the Laotian government has introduced gradual economic reforms to liberalise the markets. The economy grew an average of six per cent between 1988 and 2008, but over one quarter of the population continues to live in poverty (2010 est. ); the country still relies mostly on foreign aid and investment. Around three quarters of the population works in agriculture; the production of rice, vegetables, spices, fruit and cotton accounts for about a third of gross domestic product. Laos exports over half of its goods to China and Thailand, its more prosperous neighbours. At present, one third of the population lives in urban areas, but the number of people moving to towns and cities is growing due to the lack of opportunities in rural areas. Although infrastructure needs improving everywhere, it remains especially underdeveloped in the countryside. In urban areas, around 72 per cent of the population has access to improved drinking water, but this figure is down to fifty per cent in rural areas. The situation regarding sanitation facilities is similar: in urban areas 86 per cent of the population have access to improved sanitation facilities but in rural areas this figure drops to 38 per cent. The country's human rights record is a matter of concern for international human rights groups who have criticised the widespread abuse and corruption by government officials. Prevailing poverty makes people vulnerable to human trafficking; men, women and children are trafficked, both within Laos and abroad. They are forced to work in factories, in agriculture, in the fishing industry or are sexually exploited. Women and girls face discrimination and abuse in many aspects of their lives. They are more likely to live in poverty and thousands are trafficked each year for prostitution. Girls, especially those from ethnic minorities and in rural areas, are less likely to attend school and are more likely to drop out of education than boys. 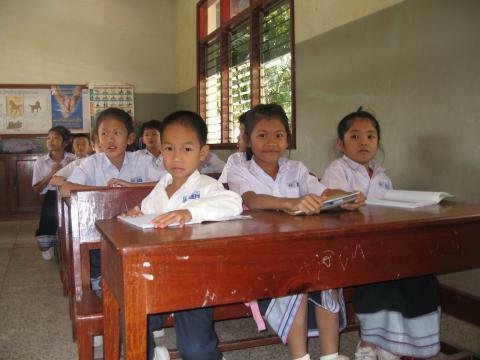 There are approximately 2.8 million children living in Laos. Most face many hardships: half of all children under the age of five are chronically malnourished. Around 11 per cent of children between the ages of five and 14 are involved in child labour. The expenditure on education is one of the smallest in the world: only 2.3 per cent of gross domestic product was spent on education in 2008. Literacy rates remain low - 83 per cent of men and 63 per cent of women are literate according to the 2005 census. There has, however, been an increase in school enrolment rates and the government is working towards universal primary education. Children in rural areas are particularly disadvantaged. Basic services such as education, health or other forms of assistance cannot reach those living in remote areas with no access to road or railway networks. Schools in rural areas have fewer resources, and a lower enrolment rate than those in urban areas. Due to the country's economic plight and the lack of comprehensive social welfare systems, the involvement of SOS Children's Villages has grown in recent years. The organisation provides day-care, primary and secondary education, vocational training and counselling to children, young people and families. The support varies according to the needs of the local population; for example the social centre in Savannakhet has family houses to provide temporary care for malnourished children from the neighbourhood and, in Samneua, the medical centre provides advice to the local community and also carries out vaccinations. When children can no longer be cared for by their families they can move into an SOS family, where they are looked after by an SOS mother. POB 3503, Ban Sivilay, Muang Xayth.